At Twynham we hope to inspire and develop a love of creativity through our teaching of drama at Key Stage Three. Firstly, we want to develop our young people as actors and provide them with the skills needed to perform to a high standard. Secondly, we want to help them grow as individuals and provide them with the communication and teamwork skills needed in all aspects of life. Our students will learn how to perform both improvised and scripted work, taking time to interpret and analyse their own work and the work of others. What is it like to study Drama at GCSE? The GCSE Drama course has both a written and a practical exam. You will have to sit a 1 hour 45 minute written exam which will ask you questions about drama terminology, set plays and live productions. You will tested on your ability to reflect on the work of others and on your understanding of how to create a character. You will sit the written exam at the end of the course and it will be externally marked by AQA. You will be assessed on your ability to create and perform a piece of original work created by your group. You will also have to keep a devising log which analyses and evaluates the development of your piece. You will have to rehearse and perform two extracts from a scripted text. Your performances will be marked by your teacher and a visiting examiner throughout Years 10 and 11. This course would particularly suit those who have a keen interest in drama and would like to stretch themselves to learn more about new theatre and drama techniques. Students will need to enjoy both the performance and theory side of drama and be keen writers and critics. • Reliable with excellent attendance, as a drama production can only be successful if everyone in a group attends throughout the preparation and performance periods. Drama is a highly practical course where the majority of your time will be spent exploring and creating drama. In Year 10, you begin the course with a practical unit that explores the exciting and unique world of acting, looking at the many different ways to create inspiring, funny and moving drama. You will then practically explore the Malorie Blackman’s iconic play ‘Noughts and Crosses’ which delves into an alternate universe, staging and performing many of the most dramatic scenes in the play. You will end the year, creating your own original piece of theatre based on a wide variety of ideas. 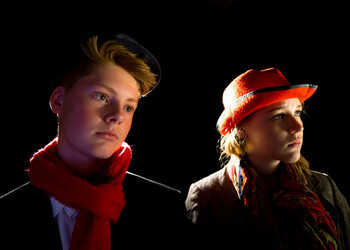 In Year 11, you will develop your acting skills further by performing two extracts from a popular modern play. You will also become a theatre critic, watching and evaluating professional actors in a live show. Year 7 start their drama course by studying important key skills, learning how to create a character, structure performances and evaluate work. Next, they look back in time at Ancient Greek Theatre, following the turbulent story of Athena and Arachne. They then have the opportunity to study World War II through the play ‘Evacuees’. At the end of the year they will use William Golding’s ‘Lord of the Flies’ as inspiration for a journey on a deserted island. Year 8 begins with students studying the influential drama practitioners, Konstantin Stanislavski and Bertolt Brecht. We then move onto dance/drama, where students have the unique opportunity to merge these two disciplines together and improve their physical theatre skills. After that we move onto the historical events of the Titanic, taking students through a timeline of this great tragedy. Students will then get the opportunity to explore the intriguing and abstract world of Alice in Wonderland. We end Year 8 by studying the Shakespeare play ‘Macbeth’. In Year 9, we aim to encourage students to learn the skills needed at GCSE. We start with improvising and devising skills which explores a wide range of naturalistic and abstract ways of creating performance. We then delve into the unique world of theatrical genius Antonin Artaud. Following this, we look at a series of exciting extracts from a diverse collection of plays. We end the year studying Willy Russel’s epic musical ‘Blood Brothers’.